Frances Phillips is a registered nutritional therapist, specializing in skin and beauty related issues. Having spent over a decade working as a model while also struggling with her own skin problems, she now offers private nutrition consultations and is a freelance health and natural beauty writer. Frances now resides in London, where her practice is based. Want to get to the (literal) root of your hair probs? You might be missing one of these nine essentials. 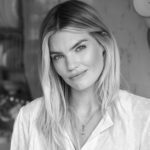 A beauty-nutritionist shares her go-tos, all brimming with benefits for your hair, skin, and nails. Here's what to add to your diet to get that glow. She shares the tips she gives behind closed doors at her private practice.